Osmosis: Distal convoluted tubule. (2019, April 20). Retrieved from (https://www.osmosis.org/learn/Distal_convoluted_tubule). The distal convoluted tubule and collecting ducts are primarily responsible for adjustments in sodium and water reabsorption. The principal cells in the collecting duct are responsible for sodium reabsorption, potassium secretion, and water reabsorption while the intercalated cells are responsible for hydrogen and bicarbonate secretion as well as potassium reabsorption. Reabsorption in the distal convoluted tubule and collecting ducts are load (independent/dependent) , especially in regard to extra sodium delivered from more proximal segments. If we zoom in, there are millions of tiny tubes called nephrons which go from the outer cortex down into the medulla and back out into the cortex again. Nephrons filter out harmful substances in the blood so that we can excrete them into the urine. Each nephron is made up of the glomerulus, or a tiny clump of capillaries, where blood filtration begins. These capillaries have very thin walls and they act like a coffee filter. Red blood cells and proteins are large and stay in the capillaries whereas blood plasma and smaller particles get filtered out. This filtrate, called tubular fluid, collects in a cup shaped structure containing the glomerulus called the Bowman's capsule. Together, the glomerulus and the Bowman’s capsule make up the renal corpuscle. The Bowman’s capsule is connected to the renal tubule which has a few segments: the proximal convoluted tubule, the U- shaped loop of Henle with a descending and ascending limb, and the distal convoluted tubule which empties into the collecting duct, which collects the urine. Zooming in on the distal convoluted tubule, it’s lined by tubule cells which are similar to the one found in the proximal tubule but they don’t have microvilli. On one side is the apical surface which faces the tubular lumen. On the other side is the basolateral surface, which faces the interstitium or the space between the tubule and the peritubular capillaries. The peritubular capillaries run alongside the nephron and return solutes and water that were reabsorbed into the interstitium back into the circulation. 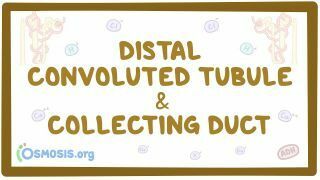 The distal convoluted tubule is split up functionally into the early distal convoluted tubule and the late distal convoluted tubule which is very similar to the collecting ducts. The early distal convoluted tubule is impermeable to water, and the tubular fluid contains more sodium than the tubule cells so sodium ends up flowing down its concentration gradient into the tubule cells using various protein channels. Some of these channels are cotransporters, meaning they move two or more different solutes at a time. One example is the Na+Cl- cotransporter on the apical surface of the early distal convoluted tubule which moves 1 sodium and 1 chloride ion into the cell. The cotransporter moves Na+ in the direction of its concentration gradient and uses that energy to move a chloride against its concentration gradient, meaning that there’s a higher concentration of chloride in the cell as compared to the lumen. Once inside, chloride leaves via Cl- channels on the basolateral surface into the interstitium, down its concentration gradient. Similarly, there are also Ca++ channels on the apical surface and Na+/Ca++ channels on the basolateral surface of the tubule cells. Ca++ ions can diffuses across the apical surface into the tubule cells down its concentration gradient, and then move across the basolateral surface into the interstitium against its concentration gradient as 1 Na+ moves from the interstitium into the tubule cells. Calcium reabsorption is regulated by the parathyroid hormone which is secreted by the parathyroid glands in the neck. When parathyroid hormone bind to the tubule cells, they start making more more Na+/Ca++ channels which increase reabsorption of Ca++. But, before sodium can build up in the cell, it’s pumped out through the basolateral side into the interstitium by a protein pump called the Na+/K+ ATPase. The Na+/K+ ATPase pumps 3 Na+ out of the cell and lets 2 K+ ions into the cell from the interstitium. Since there’s more Na+ in the interstitium and more K+ in the cell, this goes against both of their concentration gradients and that’s why the pump requires ATP. So the Na+/K+ ATPase on the basolateral surface keeps the the intracellular Na+ level low, and that allows more Na+ to flow into the tubule down its concentration gradient on the basolateral surface through the Na+/Ca++ channels, and on the apical surface through the Na+Cl- cotransporter. Normally, the early distal convoluted tubule reabsorbs about 5% of the filtered sodium but this reabsorption is load dependent, which means that when more sodium makes it past the proximal convoluted tubule, more is reabsorbed in the early distal convoluted tubule. This is possible because more sodium delivered to the distal convoluted tubule, means a stronger sodium gradient for the the Na+Cl- cotransporter.